These are definitely some sort of aphid (small sap-sucking true bugs in the superfamily Aphidoidea). Based on the coloration and shape of the pest and the host plant, my best guess is that you're looking at Hyalopterus pruni (or the Mealy Plum Aphid). Note: the scientific name of this species has changed at least 21 times! 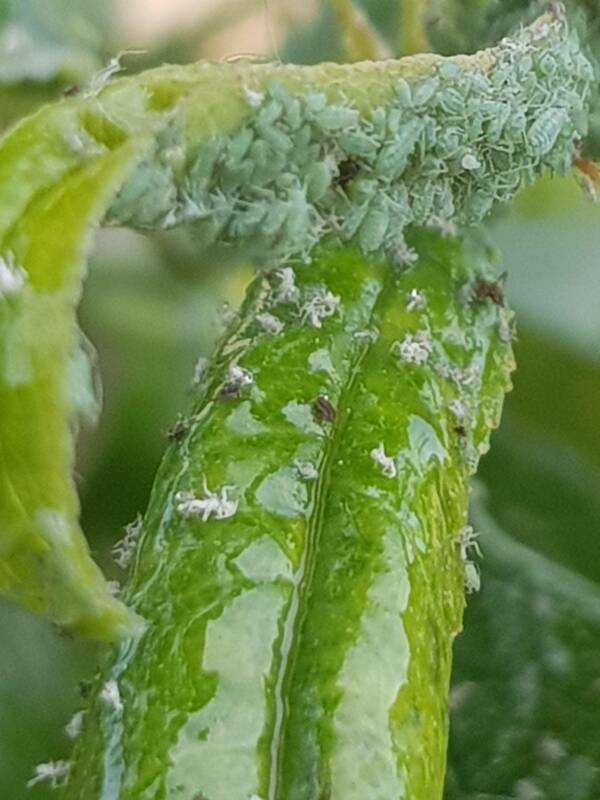 Looks like this person also found this species of aphids on a black cherry tree if you want to see more picture. Wingless adult aphids are pale green with three dark green longitudinal stripes on their backs. Their bodies are covered with a white, mealy wax. [source]. Typically trees in the Prunus genus: cherries, plums, almonds, apricots, nectarines, and -- you guessed it -- peaches. [source]. 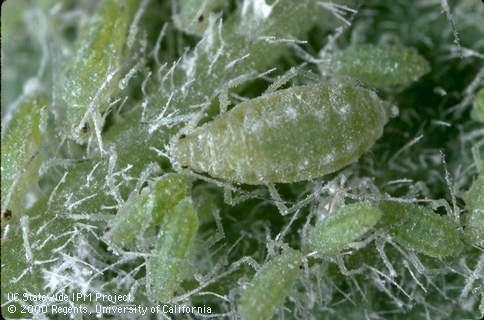 Plant can become stunted from high numbers of aphids, but the primary concern is the development of mold that grows on the aphid's honeydew. [source]. See this University of California Agriculture and Natural Resources site for management suggestions. Pesticides (typically not needed): Phosmet, Diazinon, and others in the fall; neem oil, flonicamid and others in the spring. Just because an aphid shares a name with an individual plant (e.g., the green peach aphid mentioned in the comments) doesn't mean that the species is limited to just that plant or that any aphid found on said host is that species. Many aphids feed on a wide range of host plants, so limiting your host to an individual species doesn't necessarily rule out a wide range of pests. However, it is not uncommon for an aphid species to stick to a single genus, narrow set of genera, or narrow set of families of host plants. Not the answer you're looking for? Browse other questions tagged species-identification zoology entomology trees pest-control or ask your own question. what is this ant-sized black insect? Species identification - what kind of worm is this? What is this insect that showed up after I left food out? How can I get rid of it? Why kind of fly is this and how do I control it?